China is undoubtedly the current biggest market this side of Asia, which accounts for half of Asia’s 50% partaking to the overall global butyl sales. The marked slow growth in the country may seem a deterrent for industry producers and manufacturers, however, German chemicals firm Lanxess sees the situation as temporary. The decline, however, is still a healthy growth, Commander continues, adding that many industries in the world would “still be happy” reaching that growth percentage. The overall sluggish economy has also been raised by Dr Werner Breuers, Member of the Board of Management, Lanxess, and which, he says, the company sees is in a temporary phase as the country is in economic transition. “It may be hard to predict for how long (the sluggish economy situation) lasts, but we see it recovering in the first half of 2013 through 2014”, he told PRA during the press conference. The premium halobutyl and regular butyl production plant, which spans 150,000 square metres, is Lanxess’s largest single investment on record that will serve the region, including its topmost customers from China, where the company has nine wholly owned subsidiary, one joint venture and two major R&D centres; and India where it has manufacturing units for six of its business units. Commercial production will commence in the third quarter of this year, and is expected to achieve full capacity by 2015. With a 100,000 metric tonnes nameplate capacity, the plant will be producing halobutyl and regular butyl, depending on the market requirement, says Breuers. The firm sees the region expanding, and also eyes increased demand coming from Indonesia, Malaysia and Thailand, says Commander. Breuers adds that Korea is also an important market for them, in support of Hankook’s strong standing, despite the torpid market. Lanxess is the first butyl rubber manufacturer to have a wholly-owned global presence. The newly opened plant in Singapore joins existing butyl rubber plants in Sarnia, Canada, and Zwijndrecht, Belgium. This means that the specialty chemicals company now has state-of-the-art facilities on three continents. The butyl rubber facility in Singapore - the most modern of its kind in Asia, and is said to create about 160 highly qualified new jobs that will mainly be filled locally. Also present at the event were Teo Chee Hean, Deputy Prime Minister of Singapore and Angelika Viets, the Ambassador of the Federal Republic of Germany to Singapore. "Riding the growth trend in Asia, Lanxess is using Singapore as their base to grow their Pan-Asian business. With companies further expanding their activities in Singapore to include headquarter and R&D activities, we expect a wide range of enriching career opportunities for many Singaporeans in the chemicals sector. 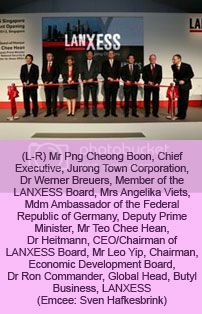 I would like to extend my heartfelt congratulations to Lanxess on the opening of its first butyl rubber facility in Asia, and look forward to many more years of fruitful partnership," said DPM Teo Chee Hean. The butyl rubber market is expected to grow on average by 5% in the coming years, with the main driving force being the megatrend mobility, above all in Asia. The tyre industry accounts for around three-quarters of sales at Lanxess's butyl rubber business unit and more than 50% of sales is generated in Asia. For example, passenger cars in China and India alone are expected to more than triple within the next 15 years, mainly due to a growing middle-class there. In addition, there is a clear trend towards the use of radial or tubeless tyres for buses and trucks in India and China, which is changing the face of commercial mobility. Modern radial tyres require an inner liner made of halobutyl rubber, which helps keep tyre pressure constant for longer because of its impermeability to gases, thus saving fuel and reducing CO­2 emissions. “With our high-tech products, we are a leader in enabling ‘Green Mobility’,” said Heitmann. A new application for bromobutyl rubber, a type of halobutyl, is in the tread of tyres. It enhances the characteristics of tyres by improving both grip and the associated wet braking performance without compromising rolling resistance. Another use for halobutyl rubber is in pharmaceutical closures. This special-purpose rubber is even required by law in some Asian countries, for example China. Some of the world’s biggest pharmaceutical closure manufacturers are to be found in Asia. Pharmaceuticals account for some 10% of Lanxess butyl business. Other applications for butyl rubber are protective clothing, shoe soles, adhesives and chewing gum. Its impermeability to gas and resistance to chemicals has also proven valuable in vehicle air conditioning systems and tank linings. The manufacture of butyl rubber is highly complex and involves process steps at temperatures ranging from minus 100 to plus 200 degrees Celsius. 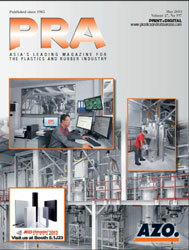 The current production process used for butyl rubber has been upgraded and has been implemented in Singapore. Around 10% of the total investment has gone toward technologies that make the butyl rubber plant more environmentally friendly. For example, significantly less steam is used in the manufacturing process than in comparable facilities, leading to lower energy consumption. Chemical compounds from the production process are treated in state-of-the-art thermal off gas units, so that the environment is not affected. “This process is evidence of our global leadership in rubber manufacturing. I am very proud that we are setting new standards in the industry,” said Ron Commander, Head of the Butyl Rubber business unit. The butyl rubber facility was engineered and constructed by Foster Wheeler Asia Pacific Pte. Ltd. on a 150,000 sq m plot on Singapore’s Jurong Island. The premises have been leased from the JTC Corporation, a Statutory Board under the Singapore Ministry of Trade and Industry.